This is a fairly recent addition to my collection of older manual focus lenses. 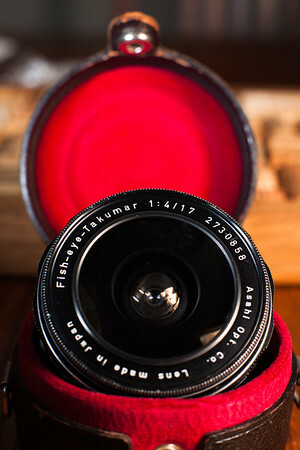 It is a Takumar 1:4 17mm Fish Eye. They're not too hard to find on eBay, but always seem to drive a premium price. After watching for a while, I found one at the lower end of the scale, bid, and won. It isn't a perfect example, but the flaws are minor enough for it to be perfectly serviceable. I'm less interested in spotless museum quality collectors items than I am functional, interesting bits of gear to enjoy actually using. Haven't yet shot very many frames with this fish-eye. Haven't really had the time. It is VERY wide - 180deg FOV. Found it is very very easy to include fingers and such in the frame. Am using these older lenses on the 5dII by way of various M42 to EOS adapters. Have tried a couple different ones. Have a "pro" Fotodiox right now which seems to be the best of the bunch - and even that one sometimes doesn't mate well enough for the focus chip to function. Most of these are made over seas. The chips work, but seem like a real hack. Mostly an after thought, they're typically just glued onto the adapter ring. However, since the 5dII doesn't have a split-prism focus screen available, unless you have really good eyes, the chip is a necessary evil. Of course, with a fish-eye, like this, it isn't quite as much of a worry as with other lenses.